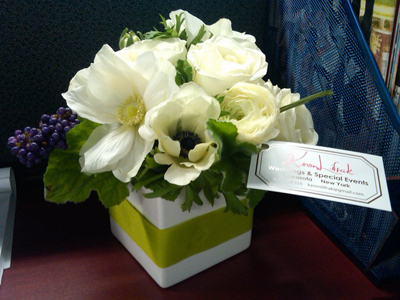 Keren Lifrak Flowers, a nice way to say thanks -- any day. A couple of months ago I listed my latest trend "The Ring Corsage." One of the major national magazines is considering publishing it in their fashion section. With the help of Ellie P. Campbell Photography we shot a small spread to show a variety of corsages. While we're waiting to hear more... I'm posting the latest pictures on the blog to give some more ideas to you "out of the box" brides out there. From yours truly, Keren. Green: chrysanthemum with sage and green berries. Classic, organic and works with almost everything! Yellow: chrysanthemum with an aqua ribbon and a clear button in the center adds a playful touch and a fun color combination. Red: a classic, stunning red rose in full bloom with a whimsical blue and white striped ribbon. Pink: a soft, elegant look with a velvet ribbon and cluster of black crystals. 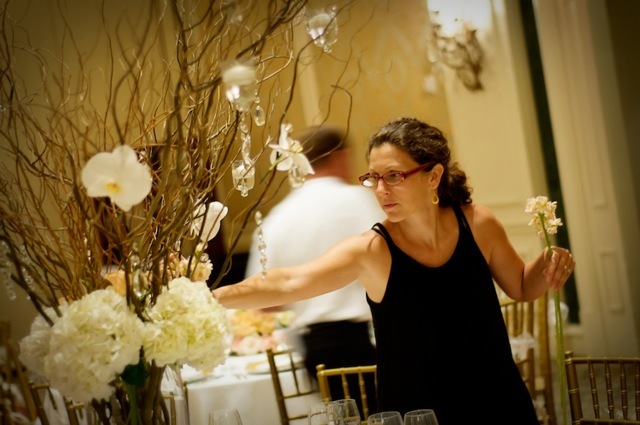 Photographer Kollene Carlsson of Blonde Cow Photography was kind enough to send a snippet photo of me working on Stacey and Ashley Bloom's centerpieces at the Ritz Carlton in Sarasota last weekend. What a tease! I can't wait to see the event photos. 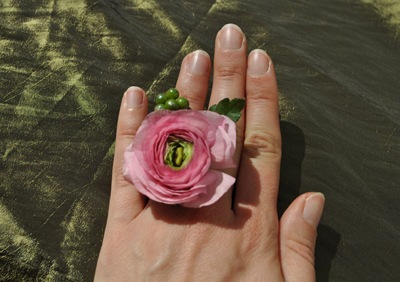 Check out my latest trend: The Ring Corsage! How many moms out there are too trendy for the old school, cumbersome corsage that drags your dress off the shoulder all night? I know I am. That's why I came up with a new trend -- as delicate and cute as a button corsage. The ring corsage is a fresh, elegant touch. It looks beautiful but not overbearing. It can also be a great touch to replace bridesmaids bouquets -- especially if you are on a tight budget.